Baby taking wifes name: Why we decided to challenge convention. When my first daughter was born in May there were all sorts of things my wife Melanie and I had to decide: At home or in the hospital? Down the chute or via the sunroof? Cloth or disposable? Breast or bottle? None of these were simple choices, and we were open to arguments on both sides. But one decision was easy for both of us – our baby would take on my wife’s family name, not mine. While we have defied one convention in this naming decision, we hope to create a new one. For us, the tradition of a woman taking on her husband’s name had a faint hint of possessiveness that was out of tune with our desire for individual identities. It also put a partner in an awkward position if the relationship were to dissolve and they were left with a family name for a family of which they are no longer a part. While our relationship was strong then and remains so, you never know what the future will bring. So what name to give to children? One option was a hybrid name that combines parts or all of the parents’ names into a new name, whether as a portmanteau or a double-barrelled name. But this relies on the good fortune of names that work well together, which was not the case in our situation. It could also be difficult to perpetuate across future generations without names becoming long and unwieldy. I know some other families that have done it this way, but it wasn’t right for us. We needed another approach. We had long been fond of the idea of children taking on the family name of their same-gendered parent, so a daughter takes on the family name of her mother and a son takes on the family name of his father. This approach is a more equal one, giving both parents a chance to pass on their name and not privileging one parent over the other as the head of the household. So once we found out we were having a girl, it was an easy decision to follow the approach we had agreed to. As the parent whose name would not be borne by his child, I was totally relaxed about the decision. The pride I will take in my daughter in the years ahead will come from her personality and her accomplishments, not specifically from her family name. 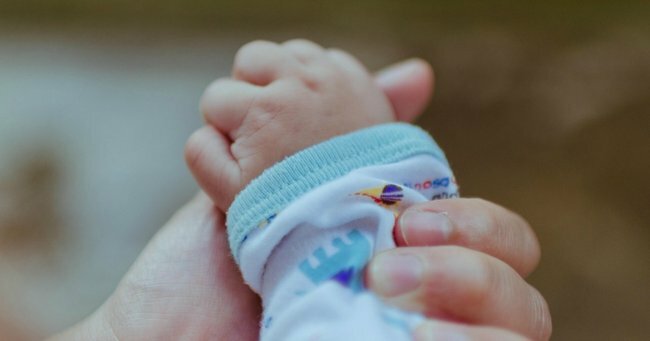 Despite much progress being made in confronting the sexism of everyday life, from the workplace to the home to the public arena, many people remain reluctant to grapple with the chauvinism inherent in the naming tradition of our children. Many men, even those who consider themselves progressive on social issues and those whose wives have kept their own family names, are keen for their children to take on their own family name. The reluctance is understandable – it can seem emasculating to a father for his offspring to not bear his name, but if we are serious about gender equality we must be open to it. After all, generations of women have had their family name disappear, either at marriage or at the birth of children. And both mothers and fathers have plenty of opportunity to impart a legacy for their children to convey beyond merely their name. In our daughter’s case, we had extra reason to give her Melanie’s family name. I am one of five children (including three boys) so there is a strong chance that my family name will be passed on through at least one of us. But the future of Melanie’s family name is less assured. She has one sister, whose wonderful daughter has her father’s family name. Melanie also has two female cousins with her family name. Under the conventional approach to naming, their name in this part of the family would end at this generation. I am pleased that, with the arrival of our daughter, her family name will live on for at least one further generation. There are a few risks to our approach. If we have a son down the track, he would have a different family name to his sister. Some people may be unclear on what to call our family as a collective unit. When I was growing up, my family was affectionately known by all who knew us as “The Sharps” (no, not “The Be Sharps”, although that would have been fun). For Melanie and I, our family as a unit will probably become known by a double-barrelled interpretation of our two names, which is easy enough for people to understand. There’s also the prospect that people wonder whether I am in fact my daughter’s father if we don’t share a name. But that’s their problem, not ours. So that’s how we came to name our daughter the way we did. Of course, the name is hers, so she is free to do with it what she wishes – to keep it, to modify it or to replace it with something entirely different. For now, though, we think it sounds just great. This post originally appeared on Ari on the Web, and was republished here with full permission.